Gabriela Mistral was the pseudonym of Lucila Godoy Alcayaga, a Chilean poet-diplomat, educator and feminist. She was the first Latin American to receive the Nobel Prize in Literature, which she did in 1945. Throughout her early years Gabriela Mistral was never far from poverty. By age fifteen, she was supporting herself and her mother, Petronila Alcayaga, a seamstress, by working as a teacher's aide in the seaside town of Compañia Baja. Aged 17, she met Romeo Ureta, whom she fell in love with. But, more tragedy was to strike three years later, when he committed suicide. This loss devastaed Gabriela and left a lasting scar throughout her life. More tragedy was to strike later, when a nephew also committed suicide. These events had lasting effect on her poetry. An important moment of formal recognition came in 1914, when Gabriela Mistral was awarded first prize in a national literary contest. As well as being a poet, Gabriela Mistral become an international renowned figure in literature and education. She was involved in the early cultural committees of the League of Nations, and played an important role in shaping the educational systems of Mexico and Chile. She also worked as a Chilean consul in cities, such as Nice, Naples, Madrid and New York. In her work as Chilean consul she sometimes came into contact with fellow Latin American poet – Pablo Neruda. Mistrale was an early advocate of the originality of Neruda’s poetry, and agitated for him. Gabriela Mistral also taught Spanish literature in the United States at Columbia University, Middlebury College, Vassar College, and at the University of Puerto Rico. In 1945, she was the first Latin American to be awarded the Nobel Prize for literature. She continued to receive awards for her remaining years. 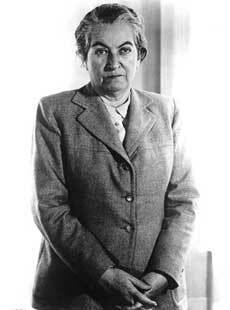 Gabriela Mistral died from pancreatic cancer in January 1957, aged 67.